Let's start off with the cheese. As you can see by the photo, the cheese wasn't even cooked! Any chef of quality, especially at such a fine hotel chain like The Four Seasons, should have never sent this pizza out in this condition. The dough, seemed like it was premade and just waiting for the sauce and cheese to go on. It was undercooked as well and lacked any type of taste. The sauce offered little much in relief to the other crappy ingredients used. Half of the sauce was removed by me and left in a crumpled up napkin. And to think, after the $4.00 mini soda bottle I had with this pizza, I was $20.00 poorer, and with a terrible taste in my mouth, from the food, and that such an upscale establishment would serve me this sh*t! Do yourselves a favor, and if you are at the Four Seasons Hotel in Austin, Texas, make sure to avoid this pizza. In my opinion it is not worth $5.00, let alone $20.00. Such a rip off! 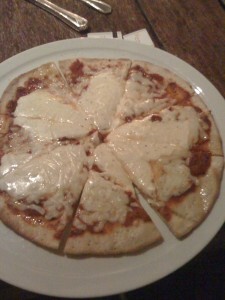 The Four Season in Austn gets 1 out of 8 slices for their ridiculously expensive, sh*t pizza!